Dele Alli should be wary of anti-diving laws. Surprisingly, some of the proposed law changes in football appear to be pretty good ideas. Any move to stop the cheats, time-wasters and negative nellies spoiling our game is okay by me. Manchester United manager Jose Mourinho likes to smother the fun out of football. Sadly no matter what new laws are introduced, coaches and players will find ways around them. For instance the medically sensible instruction to stop the play automatically for head injuries has led to players feigning such injuries to thwart opponents from moving into threatening positions. 1) Passing to yourself at a free kick, corner kick or goalkick has been a recent introduction into field hockey with very positive results. It keeps the game flowing which might irritate the likes of Jose Mourinho who love to smother the fun out of football, but it should please the rest of us. 2) Taking a free kick when the ball is still moving is also a great idea. The more advantages for a team winning a free kick the better. Jeremy Corby and his supporters has been piling on the pressure lately. 3) 30-minute halves with the clock stopping every time the ball is out of play is a cracking idea. You’d get more football for your money (admittedly not an advantage at Cobblers) as the time the ball spends in play in a current 90-minute match is less than an hour. In theory it should stop the excessive time-wasting currently occurring every time there is a goal, or a substitution or even a throw-in as time wouldn’t be ticking on. 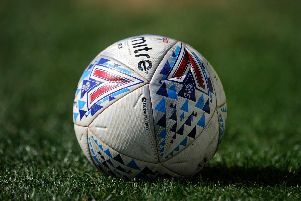 It would also take timing out of the hands of the match referees to enable him to concentrate on foul detection, an area in which Posh match officials need all the help they can get. If this law is introduced it would presumably would mean the introduction of stadium clocks so it would also stop the battery on my mobile phone becoming drained of energy so quickly which is a huge plus. 4) A goal-kick being taken on the side the ball goes out is sensible. Naturally goalkeepers take advantage of the current law to waste time by switching sides unnecessarily. 5) ‘A penalty kick can only be scored, missed or saved with players banned from scoring from a rebound from the goalkeeper’ is a daft one though. This is designed to stop encroachment into the penalty area, but if four officials can’t apply the current law effectively they shouldn’t be taking charge of professional games. While we’re discussing law changes I’d caution anyone other than the captain who gets within moaning range of an official. This would stop mob pressure (most likely to be applied by Corbyn-supporting players) on referees. I’d also issue retrospective bans for any player exposed as a diver. This would ensure Dele Alli remains fresh for any end-of-season tournaments. TV and radio pundits should also serve automatic bans for obvious errors thus ensuring Robbie Savage departs from our screens for good.